Screening Sunday April 29th at 12 noon and Thursday May 3rd at 3.10 p.m.
Happily we have two screenings of the new Koreeda Hirokazu film. His earlier titles include the beautifully low-key Our Little Sister (Umimachi Diary, 2015) and the more dramatic but equally complex After the Storm (Umi yori mo mada fukaku, 2016). Koreeda is both a seriously fine film-maker and adept at working across genres. Apart from these two titles his output includes the children’s adventure I Wish (Kiseki, 2011); the Samurai film Hana (Hana yori mo naho, 2006); After Life (Wandafuru raifu, 1998) set in an equivalent of the Christian purgatory. In this new film Koreeda again rings the changes in what appears on the surface to be a ‘legal thriller’. Misumi (Yakusho Kôji) is under arrest and charged with murder. A previous conviction for a double murder explains the title. 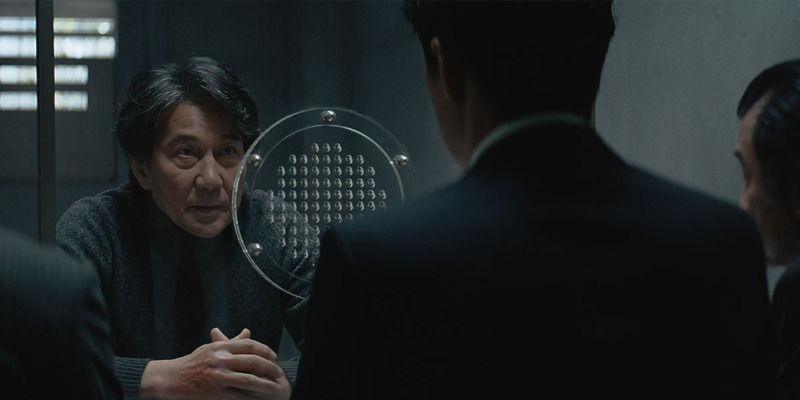 Shigemori Tomoaki (Fukuyama Masaharu) is recruited to his defence team. He finds that Misumi’s account of events changes nearly every time he is questioned. He also finds that the family of the murdered victim, the wife Yamanaka Mitsue (Saito Yuki) and daughter Yamanaka Sakie (Hirose Suzu), also offer suspect testimony. The legal plot is not about innocence or guilt but the severity of the charge which may or may not lead to execution. But if Koreeda works across genres, as an auteur, he is still identifiable by the themes which dominate his films. In this drama three of the main characters are fathers who have failed their families, in particular a daughter. Here the film crosses over with many of the director’s earlier works. Along with those mentioned these include Still Walking (Aruitemo aruitemo, 2008) and Like Father, Like Son (Soshite chichi ni naru, 2013). There are parallels in the settings as well. The main places are towns close to the Tama River, south of Tokyo; but we also visit the region of Hokkaido in the north, noted for its cold climate. The style is somewhat faster in rhythm than Koreeda’s other recent films. Here the team are working for the first time in an anamorphic ratio. Cinematographer Takimoto Mikiya makes excellent use of the wide frame. There are some evocative night-time sequences and a stunning use of superimposition late in the film. Koreeda who scripted, also edited this production. And there is an evocative music score by Einaudi Ludovico. I thought, along with Sweet Country (Australia, 2017), that this is the most impressive new release so far in 2018. The film was shot in a digital format and has transferred very well to DCP. The quality of the visual and aural presentation means that much of the pleasure from the film will be missing on video or download. So this is a title to be seen at the cinema.